By Robert Roy Britt — Anthem’s dog park project is tentatively slated to start by early next year and open in late 2019. After multiple public discussions about it, Anthem Community Council plans to consider two proposed locations at its monthly meeting June 27. The board may choose to vote on the location, said Neal Shearer, the community’s CEO. Other issues, including specifics about project scope, design and costs, would be considered in later meetings. Meridian Drive, east of St. Rose church and Merrill Gardens. Shearer’s staff will present to the board conceptual sketches and pros and cons of each location. 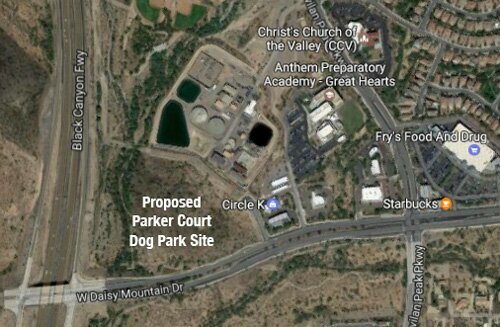 One of the two proposed sites is on council-owned land at Parker Court, near I-17 and Daisy Mountain Drive. 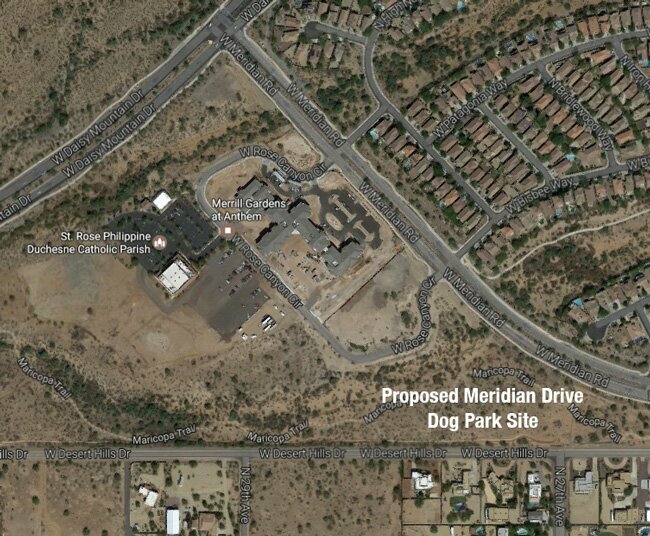 The other proposed site is also on council-owned land off Meridian Drive on the far eastern side of Anthem. In past meetings, residents and council members have cited concerns about traffic around the Parker Court site, but noted its more central location. One potential downside to the Meridian Drive site is proximity to residential areas. Both locations are have been evaluated for soil conditions and other factors that could affect design and costs. Preliminary plans calls for multiple off-leash, fenced grassy zones, so use can be rotated and large and small dogs can be separated. The park will be lighted, gated and likely accessible to Anthem residents only. The project’s earlier cost estimates, around $1 million, are expected to be revised upward given rising construction costs and other factors, Shearer said. “We know those numbers are likely to change,” he said. The dog park construction will come on the heels of a pickleball court project, scheduled to start construction later this year and open by the end of the year. Both are to be paid for out of the enhancement fund, which is fed by a quarter-percent fee on home sales. That fund held $1.6 million on May 1.